Activate the children\'s Creativity: 4 in a row game is puzzle games,can improving your child\'s patience,concentrations,imagination and creativity,increase IQ level. Eco-friendly material:Four in a row made of ABS plastic,it is a safe children toys,friendly tips:must be used under the direct supervision of adults to avoid children swallowed it. 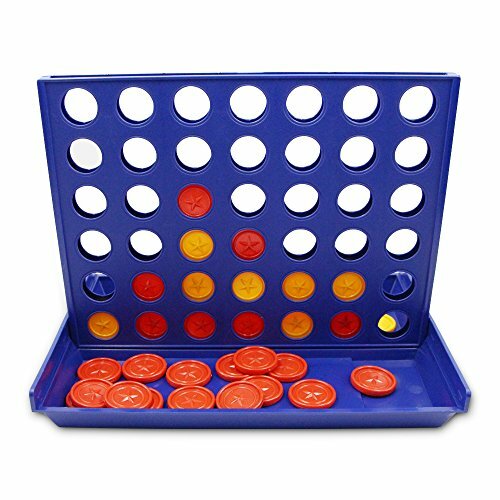 Easy to carry: This product is 24*17*4cm/9.4*6.5*1.5ins and includes 21 red discs, 21 yellow discs.,convenient to carry when you travel, easy to assemble,you can play any time. Funny games:Suitable for all ages,it is a great game in family and friends at birthday parties, family reunions, community centers, after-school programs, you will have more fun experience in play game with your family and friends. Perfect gift:Best gift for your kids,interactive game can promote communication between parents and children when play 4 in a row game together. And improve teamwork cooperation. Love this game and I love how the slot board folds down over the chips for storage and you don't have to fool with a box.